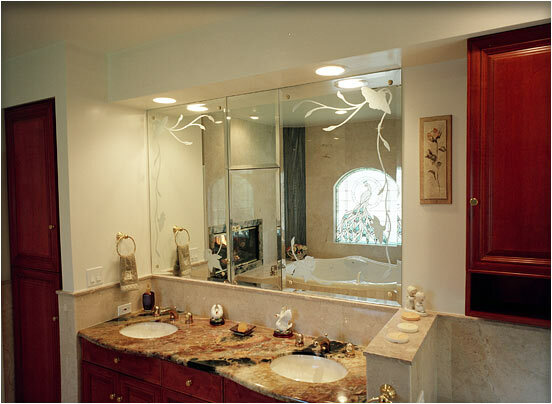 Smaller Project 2-1, Master Bathroom Suite Remodel » Roger Perron Inc. Here is a master bathroom suite remodel with a striped-marble simulated waterfall shown in the mirror. If you look to the left in the background of the mirror you can see the simulated waterfall and fireplace. The other side of the fireplace is in the next photo. The mirrors are beveled with a hidden medicine cabinet.